Jordan Brand is on for another treat this month with the release of another good-looking edition of the Jordan 2’Smooth, which is one of their new models released this year. The Jordan 2’Smooth, which created buzz during its debut few months ago, will be released in a strong Black/Metallic Silver – White colourway, which might looks simple, but it is definitely an eye-catcher. This will hit the shelves anytime this month so start saving money for it now and you will surely like it! 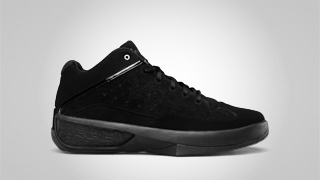 “Stealth” Jordan SC-2 to Hit Shelves This August! “Wings for the Future” to Hit Shelves! Air Jordan 8.0 to Hit Shelves Soon!